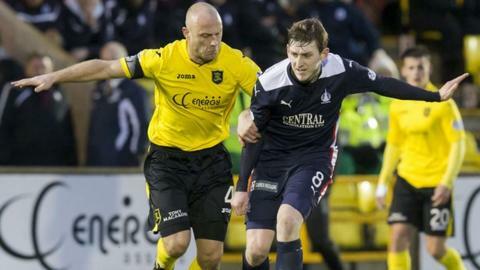 Blair Alston's goal against Livingston secured a third straight win for Falkirk and kept the Bairns within two points of fourth-place Hibernian. The visitors came close when Will Vaulks' strike hit the goal-frame. However, they did find the net when Alston collected a pass from Tom Taiwo and curled it in from inside the area. Falkirk's David McCracken hit the post after the break as Livi remained four points adrift at the bottom of the Scottish Championship. Match ends, Livingston 0, Falkirk 1. Second Half ends, Livingston 0, Falkirk 1. Corner, Livingston. Conceded by Jamie MacDonald. Attempt missed. Will Vaulks (Falkirk) right footed shot from outside the box is too high from a direct free kick. Foul by Simon Mensing (Livingston). Alex Cooper (Falkirk) wins a free kick in the defensive half. Jordan White (Livingston) wins a free kick on the right wing. Substitution, Livingston. Robert Ogleby replaces Daniel Mullen. Substitution, Livingston. Myles Hippolyte replaces Gary Glen. Substitution, Falkirk. Alex Cooper replaces Tom Taiwo. Attempt saved. Jack Beaumont (Livingston) right footed shot from outside the box is saved in the top left corner. Kieran Duffie (Falkirk) is shown the yellow card. Shaun Rutherford (Livingston) wins a free kick in the defensive half. Substitution, Livingston. Michael McKenna replaces Mark Burchill. Corner, Falkirk. Conceded by Daniel Mullen. Attempt missed. Will Vaulks (Falkirk) header from the centre of the box is too high. Corner, Falkirk. Conceded by Callum Fordyce. Attempt saved. Craig Sibbald (Falkirk) left footed shot from outside the box is saved in the top centre of the goal. Attempt missed. Mark Burchill (Livingston) header from the right side of the box misses to the right. Attempt saved. Rory Loy (Falkirk) left footed shot from outside the box is saved in the centre of the goal. Second Half begins Livingston 0, Falkirk 1. First Half ends, Livingston 0, Falkirk 1.